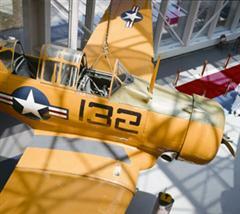 The National Naval Aviation Museum in Pensacola will treat you to an exciting time. It has become one of the most popular Florida tourist attractions for adults and kids alike. Enjoy the hands-on history of Naval Aviation and see more than 150 beautifully restored aircraft and over 4,000 artifacts representing Navy, Marine Corps and Coast Guard Aviation. My personal connection to naval aviation goes back more than 50 years when I was a Naval Aviation Cadet taking my flight training in the Pensacola area. The science of aviation and the community of Pensacola have made giant strides since then. Feel the thrill of flight in the Flight Simulators, or visit the Naval Aviation Memorial Theatre and catch all the drama and power of the amazing IMAX® films. Treat yourself to a tasty lunch or dessert in the Cubi Bar Café. Take home a unique memento from the Flight Deck Store. Spend a cool day inside the Museum with countless things to touch and see, more to experience and enjoy! Whether or not you are a Navy veteran, you will enjoy your visit to the museum. Admission to the museum is free! Not many popular Florida tourist attractions can make that claim! The museum is open daily from 9 a.m. until 5 p.m.
Movies are shown in the IMAX Theater each hour beginning at 10 a.m. The last movie starts at 4 p.m. The museum is located at the Pensacola Naval Air Station, approximately seven miles west of downtown Pensacola. Take Exit 7 (Pine Forest Road, 297). Head south about 1.5 miles to Blue Angel Parkway. Turn right and drive about 12 miles to the west gate of Pensacola NAS. The museum is three miles ahead on left. Parking and admission to the Museum are free. Parking spaces for those with disabilities are available near the Museum's main entrance. An RV park is located just down the street from the Museum at Oak Grove Park. The many other things to do and see in this area are described in Pensacola Day Trips elsewhere on this site.